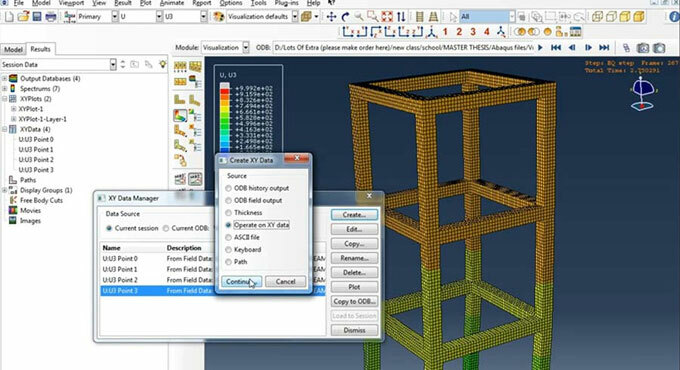 This construction video briefly shows how to use the commercial Finite Element program Abaqus to model the multi-stories structures made with framed reinforced concrete to resist the earthquake. The Abaqus Unified FEA product suite provides robust and comprehensive solutions for both regular and advanced engineering problems which include an extensive range of industrial applications. Abaqus is generally applied in the automotive, aerospace, and industrial products industries. The program is mostly recognized because of the widespread material modeling ability. The program can be easily customized. Abaqus also offers a wide array of multiphysics techniques, like coupled acoustic-structural,piezoelectric, and structural-pore capabilities. The program is ideal for production-level simulations where multiple fields should be combined. Abaqus can easily analyze non-linear physical behavior; consequently, the package contains a wide range of material models like elastomeric(rubberlike) material capabilities. The Abaqus products apply the open-source scripting language Python for scripting and customization. Abaqus/CAE applies the fox-toolkit for GUI development.